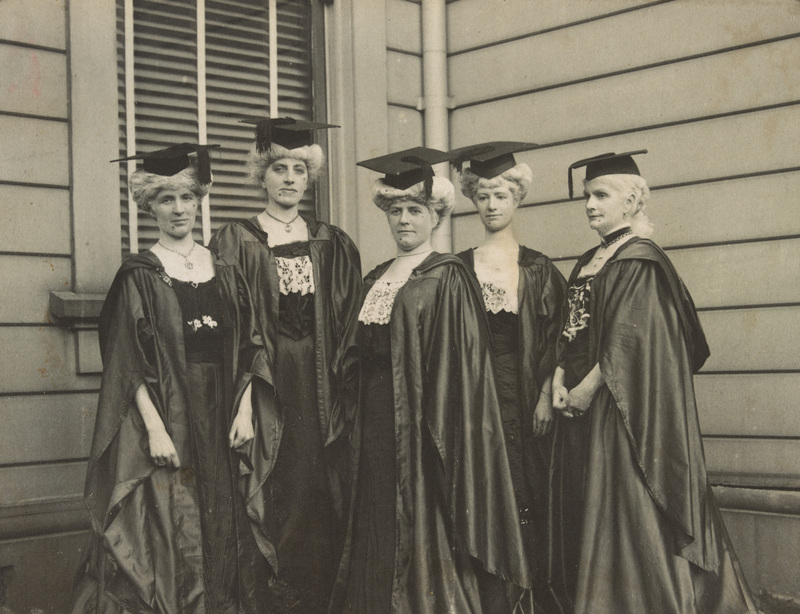 What do we make of this intriguing photograph of women in academic gowns, white wigs and beauty spots? 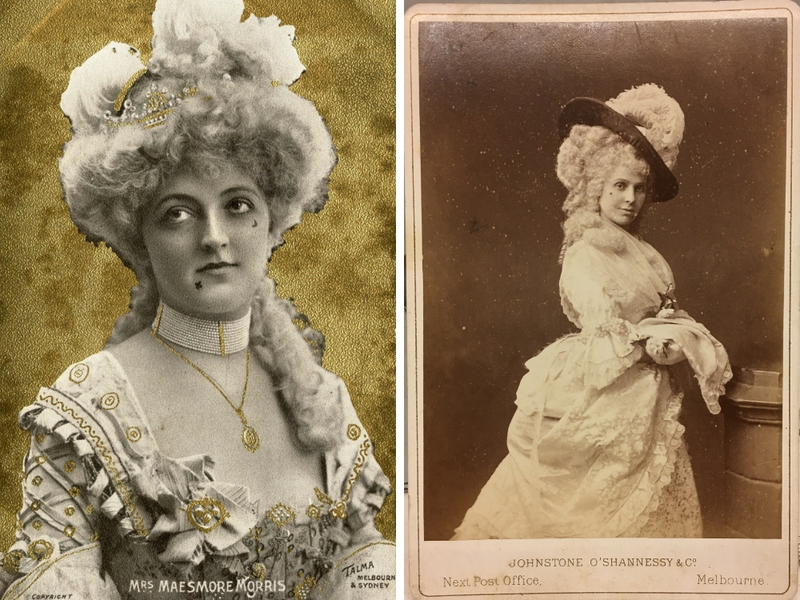 Appearing in an album from the Bland Holt Collection in the George Coppin theatre archive, it’s fair to guess they are dressed for a theatrical production– probably a comic one. It’s unclear though, what that production is, and why a group of women are dressed this way. Looking closely, the beauty spots are in identical positions on four of the women’s faces and, as will become apparent, it’s this positioning that lends comedy to this image. By the twentieth century, beauty spots were used to convey a variety of messages, bringing to mind the public declarations of love and loyalty, which today are usually emblazoned on t-shirts or tattoos rather than patches adhered to the face. The newspapers of the 1920s regularly posted articles in the ‘Women’s’ pages about the re-emerging vogue of the beauty spot. 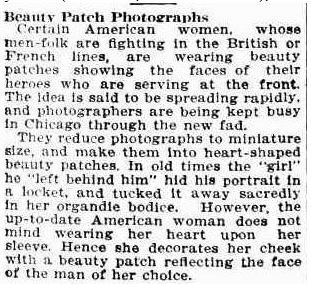 In this post-WWI incarnation, the epicentre of the trend was Paris, where women were reported wearing a beauty patch under one eye or at the corner of the mouth. 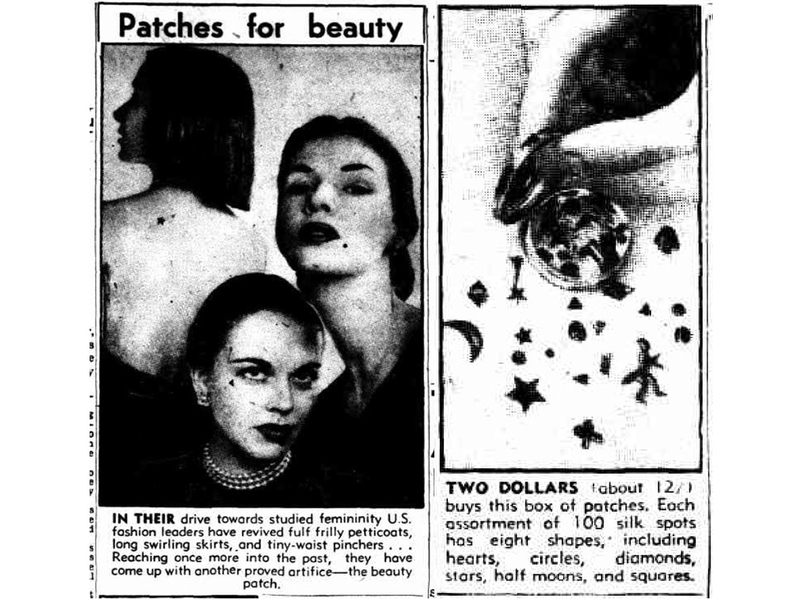 Laden with symbolic meaning, the round or square black taffeta beauty patch was heading beyond the original purpose of accentuating a woman’s white skin, and was now available in various shapes, including crescents, stars, diamonds, and even black cats or horse shoes. Stars on the left side of the chin denoted frivolity; a heart on the left of the chin meant the woman was already engaged, and when married, the patch was moved to the right side. Patches on the forehead were for intellectual women, only to be approached by serious men. There are mixed opinions about what prompted the various resurgences in the popularity of beauty spots over the decades. 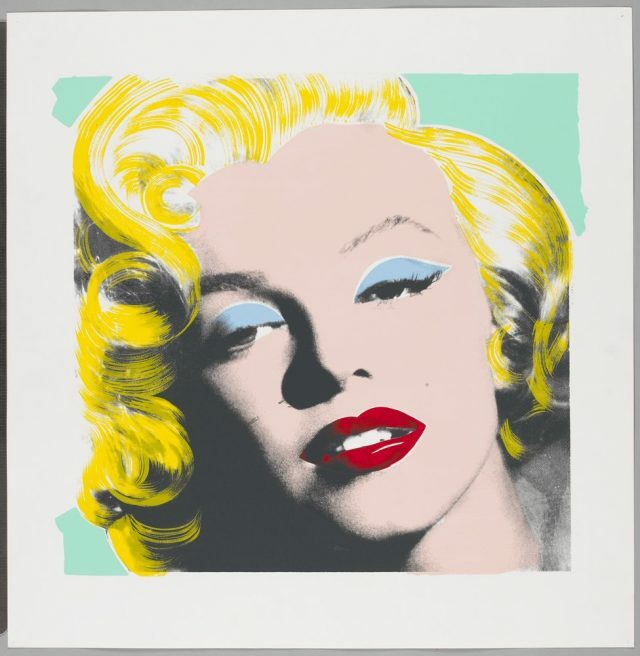 Writers of the 1920s and 40s say that it was an attempt to revive femininity in fashion, while modern theorists interpret later trends– like the trend launched by Marilyn Monroe in the 1950s– as an attempt by women to flaunt their sexual appeal at a time of repression. The screenprint reproduced below only shows a slight hint of the beauty spot on her left cheek above her mouth. Olga is a Librarian with the Heritage Collections at State Library Victoria. I love the beauty patches, especially on the academic ladies. 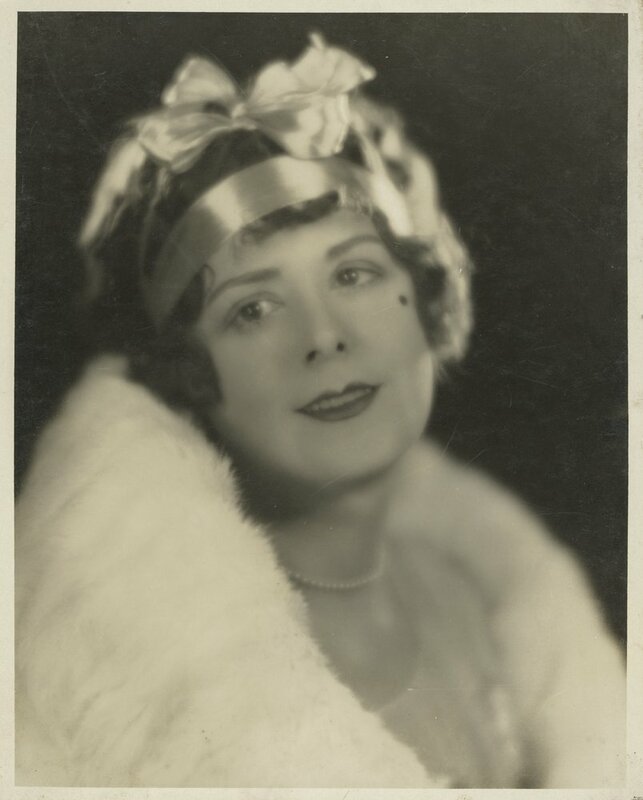 The photo of Thelma Raye is interesting too – she was the first wife of famous English actor Ronald Colman. Great blog! Could the women in academic gowns be something to do with Gilbert and Sullivan’s 1884 comic opera ‘Princess Ida’? It’s a comedy about a princess who founds a women-only university. It’s usually produced in a kind of fairytale fancy dress, but there might have been a modern dress production. The play became a reference point for the first generation of University women; the female undergraduates at Melbourne University formed a ‘Princess Ida’ club. Thank you for your comment Gerard. That is a brilliant theory!